Over the past few years, stand-up paddleboarding –or SUP as it is commonly known– has become one of the most popular and fastest growing sports in the outdoor industry. What was once seen as a niche activity has evolved into a major market segment attracting thousands of individuals, many of which aren’t necessarily traditional outdoor athletes. Part of the appeal comes from the versatility of the sport, which can be done purely for fun, but is also a great way to get fit too. SUP competitions have popped up all over the world as well, and those looking for a true challenge can even choose to paddleboarding whitewater. Like surfing, stand-up paddleboarding involves gliding along bodies of water while standing atop a board. The sport can trace its origins back to the Hawaiian islands and the South Pacific, where surfers used a paddle to help maintain stability and steer themselves in a specific direction. But the use of a paddle allows paddleboarders to propel themselves along without having to ride waves, allowing them to SUP on rivers and lakes, in addition to the ocean. If you’re new to SUP, you’re best bet is to rent the equipment a time or two before spending your hard-earned cash. Once you get serious however, you’ll likely want to own your own board. When it comes time to buy there are a number of factors you should consider before choosing the board this is best for you. Check out our guide to the basics of what to look for in a paddleboard, as well as recommendations for specific models. Boards can be expensive, particularly if you buy one new, so consider some important factors as you browse. First, and perhaps most importantly, what do you plan to use the board for? Paddleboarding is the most obvious choice, though there are a number of things one can do with a paddleboard besides that. Some people race, some go fishing on their paddleboards, others even do yoga. The boards come in various shapes and sizes, each tailored to a different activity, so pick one that best suits your lifestyle and needs. It is also important to take into account the type of water you expect to be boarding on. Will you mostly be sailing on a still lake at your local park, or will you brave the open waters of the ocean? 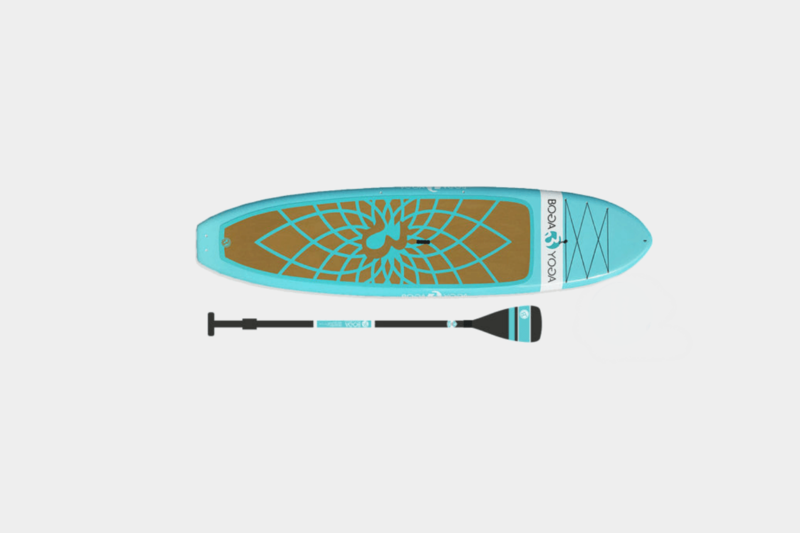 For calmer waters, a board with a displacement hull — which tapers to a fine point at the nose — is probably the right choice; they slice through water efficiently, allowing you to hit high speeds via your own paddling. The downside is that they don’t tend to be as maneuverable as some other boards. A planing hull, which has a rounder nose and a flatter bottom, rides along the surface of the water. Like a surfboard, a planing paddleboard is best suited to riding waves, where it achieves maximum speed and maneuverability. If you want to surf or do yoga on your paddleboard, the wide, flat shape of a planing hull is ideal. In addition to the shape of the hull, the size and construction matter. Longer boards are better for hitting high speeds while moving in a straight line, while shorter boards will be easier to maneuver. The same principle applies to width; wider boards will be slower but more stable, while narrower boards provide better speed. Additionally, you’ll have to decide whether you want an inflatable SUP or a traditional model that more closely resembles a surf board. The classic SUP is the solid body, which consists of a foam core wrapped by layers of fiberglass. Being rigid, these boards tend to be faster and more stable but they require extra space for storage and are more difficult to transport too. An inflatable board, as you might have guessed, is flaccid by default; users pump air into the board when they want to use it. Inflatable boards tend to flex a bit more than solid boards, although many companies use “drop stitch” weaves, where fibers lock together as the board inflates, providing more rigidity. Because you can deflate an inflatable board, they are easier to transport. If you don’t have a suitable vehicle to carry a solid board around, an inflatable one may be the most convenient option for you.